A funnel is a sequence of goals arranged in such a way as to reflect the actual flow of visitors which results in a major business objective being achieved. These business objectives can be product/service purchase, newsletter subscription, signups or any other action of value to the business owner. VWO Track helps you visualize the flow of visitors through such a funnel to help you identify dropoffs and subsequent areas of optimization. 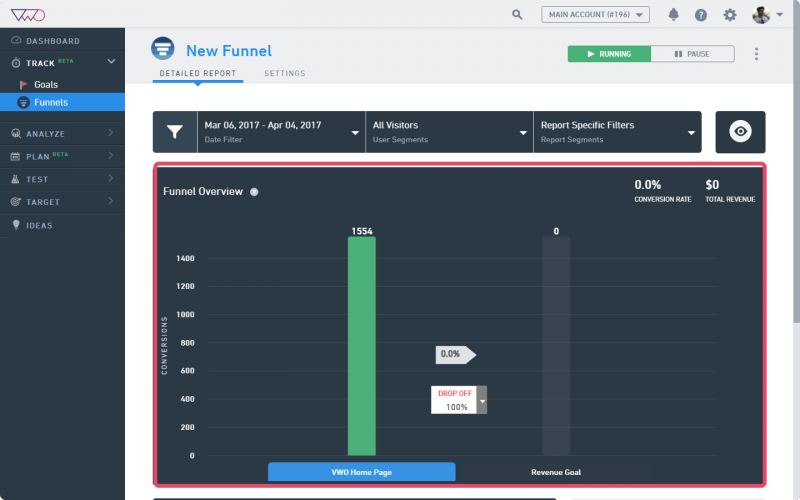 After setting up the funnel, you can analyze the data collected at each stage of the process and take corrective measures to improve the flow through the use of funnels. Landing page: This is where all the visitors land on the website. The funnel tracking process begins with tracking the total number of visits to this page. Pricing: While leading visitors to the Pricing button on the page, XYZ tracks how many visitors click the button. Request a demo: On the Pricing page, XYZ tracks how many visitors click the Request a Demo button.